Grandmother Moetu Taiha shares from her heart. 1. 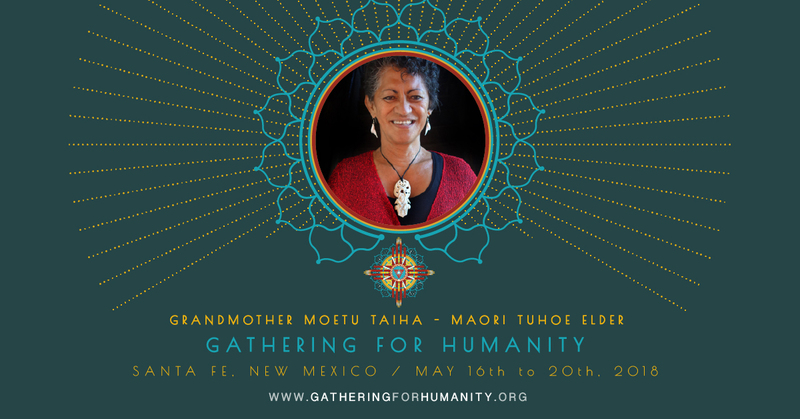 Why is participating in the Gathering for Humanity important? lt is important for me to participate in this gathering to support and come together with like minded people to share information and teachings and l’ve been taught from my “Loved Ones”. My parents, Grandparents, Ancestors and “Others”… And also to listen and integrate into myself, others wisdom to share with all those l come into contact with. 2. Why is now such a pivotal time on Earth? lt is a pivotal time now because the Energy is changing. We are in such a tech-no world where machines and “brain” have taken over and people are loosing the connection to their hearts and emotions which are our “Power”. lt’s also a time where negative and positive, black and white etc energies are becoming clearer, where people are being made more aware of their/our responsibilities to our Mother, which in the in is “Ourselves”. l think people will get to tap into and understand a part of themselves that they are wanting/needing answers for. They will get the chance to sit with, and experience what it feels like to be with Elders who have been taught from our different sources, our Ancient knowledge. 4. Why is the power of prayer of important? For me… To pray is my connection and conversations with the Higher Source. lt is my personal time with Creation/Creator, Ancestors. To give thanks and ask for guidance. 5. Why is the power of ceremony important? For me… When l think and feel about “Our”, and also ceremonies and rituals that lm guided to do that are not of my people, but is connected to the work lm doing at the time…. l feel into me and l’m connecting with all that l am, in this lifetime and all the lifetimes past. lt is acknowledging who l was, who l am, and who l will be. 6. Is now a tipping point for collective human consciousness? l feel and think it is so, We need to get into our heart energy and make the people more aware that this is how we overcome wars, trauma and other negative “stuff’ out there. We are making people conscious that LOVE is the answer, and Love will overcome. 7. What prophecies have been shared with you that align with what is happening today? When l ask my higher self this question, this is the answer l get… Mother Earth will shake herself clean… and the people will wake up. (For me… l understand that l, as a Girl, Woman, Daughter, Sister, Mother, Grandmother, Great-Grandmother and all other Feminine Energies, Am Mother Earth and when l shake off all the programs, patterns etc of learned stuff and go back to what l “know”, Then l’m able to be a clear vessel to help to wake the people up).